Disney is currently king of the film and stage fairytale market. Next year the company will add a Broadway stage version of Frozen to its roster of productions. 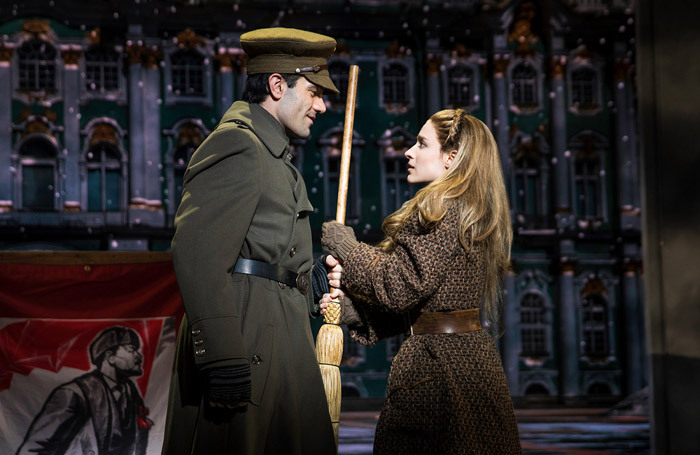 A new stage musical Anastasia, based on the animated film first released by Fox in 1997, is an attempt to muscle in on the same market; but next to the dazzle of Disney, this makes for bland family entertainment. Set against the backdrop of the Russian revolution, in which virtually the entire royal family was wiped out, it revolves around a reunion of its only two surviving members: Anastasia, the daughter of the last Russian Tsar, and her grandmother who has fled to Paris. There’s plenty of period colour in Aaron Rhyne’s lavish, luminous projections; beamed onto the mostly static, curved, white-walled set of Alexander Dodge, they summon up St Petersburg and Paris. The period flavour stops with Ahrens and Flaherty’s score, which has typically lush, swirling melodies but could come from any one of the pop operas of the last 25 years. The Oscar-nominated hit from the original movie, Journey to the Past, as well as Once Upon a December are the stand-outs here, though they’ve been augmented by nearly 20 new songs. Other significant changes from the film see the character of Rasputin replaced by a vengeful Russian police sergeant called Gleb, who is determined to fulfil his father’s mission to destroy the Russian royal family. He’s played by Ramin Karimloo – the Iranian-born musical star who first came to prominence in the West End – with impressive authority and strong vocals. But mostly the show coasts on its anodyne, and sometimes cloying charm. This is embodied in the weakly portrayed central relationship between Christy Altomare’s title character and Derek Klena as her suitor, though they both at least sing their roles well.